Update, December 8: Valve’s changes to the Steam Curation system appear to now be live. 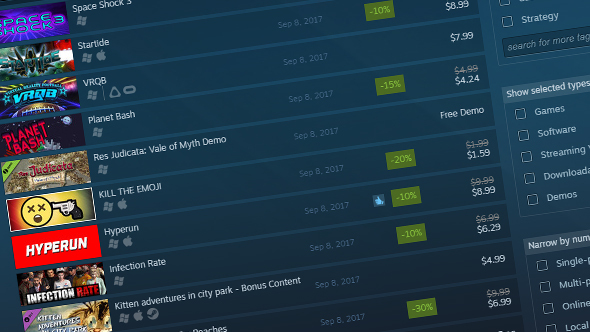 Valve announced some changes to the Steam curation system back in October, aiming to make Curators a more central part of navigating an increasingly stuffed store. The update went into beta weeks ago, allowing for Curators to have more direct control over their pages, with more customization options, video embeds, and the like, as well as some back-end features describing how their recommendations are actually affecting sales. We’ll recommend games right now: these are the best free games on Steam. But perhaps the most interesting part of the update is how it affects developers, and some anonymous game makers have let Kotaku know that the beta’s been dropped and the changes are now fully integrated. Developers are now able to send their games to curators directly through Steam. This should in theory help to prevent key-scamming operations done through email, where folks purport to be reviewers and influencers to get keys for illegitimate resale. The developer Kotaku spoke with seems positive about the changes, but expressed some concern over the fact that there’s nothing in the system allowing curators to contact developers. It’s apparently a pretty much one-way street for devs to send games out. Original Story, October 26: Valve’s been pretty transparent about the fact that they want little part of curating the Steam store, and would prefer to leave that task in the hands of users and algorithms. To that end, they’ve announced a series of updates aimed at making the Steam Curator system more useful to manage the store’s vast library. Recommendations from curators your follow will now be presented as you browse specific game genres, surfacing RPG recommendations when you’re browsing RPGs, for example. Curators will also be able to create lists around pretty much any theme they want. And Valve are fine-tuning the Recommended Curators lists to ensure you’ll get to see curated recommenders. Who curates the curators, and all that. This is all opt-in, so if you want to be at the whim of Steam’s algorithm’s that is up to you. Curators will also be able to directly embed their own videos from a variety of sources including YouTube, nicovideo.jp, youku.com, and bilibili.com, as well as customize their pages to feature whatever particular games, tags, and backgrounds they want. Curators will now be shown graphs and charts indicating exactly how their reviews are impacting their followers in the store, and Valve are “helping connect developers with Curators that are most likely to have relevant audience of followers for the developers’ game.” That comes in the form of Curator Connect, which will allow developers to seek out Curators and directly send them relevant games through Steam itself. Curators will be able to accept or deny any game received this way. A closed beta with a few dozen Curators of different sizes and interests starts today, and pending their feedback the new system will open for wider use in a few weeks. Making efforts like this to break down the barriers between developers and consumer-level Curators ends up as a weird confluence of fans, marketing, criticism, and review boiling together, but that’s a natural outcome of the increasing relevance in games news of social media users at every scale. Valve continue to assert they “can’t be the only form of curation in Steam,” and it seems they’re hanging their hat on Curator system to solve the issues that causes.